Strasser Pigeon originated in Austria as a utility pegion, is very popular as fancy pigeon. It has a colored head, neck, wings, and tail with colored feathers on the back. The rest of the body is white. The colors include, black lace, lark colors, blue, blue barred, black or white barred, blue checkered, red or yellow. Strasser pigeons resemble with King pigeon and Modena, but have a shorter height than both of them. These birds looks like a small hen, very cute and innocent. They have black eyes with a red colored ring covering it. 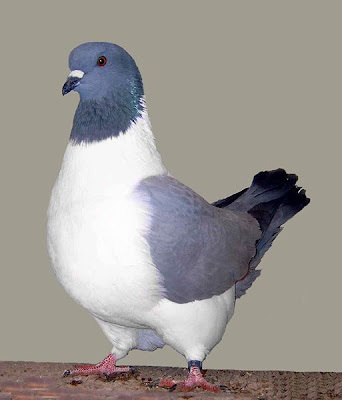 The finest pigeon breed, which I like the most.